Monument Round Vault Door - Brown Safe Manufacturing, Inc.
Old World Craftsmanship and Modern Security Combine to Recreate a Truly Unique Piece of American History Worthy of the Highest Standards. This vault door is a stunning example of the workmanship and ingenuity of yesteryear. It borrows its styling from the exact model that once protected the First National Bank Vault, and made famous by the notorious Dalton Gang. Brown Safe has meticulously detailed this vault door to its historical accuracy, but with functionality synonymous with the Brown Safe name. During the latter half of the 18th Century advancements in industrial processes and technology meant man was able to produce more complicated products than ever before. It was an exciting time of new mechanisms, machines, and merchants. 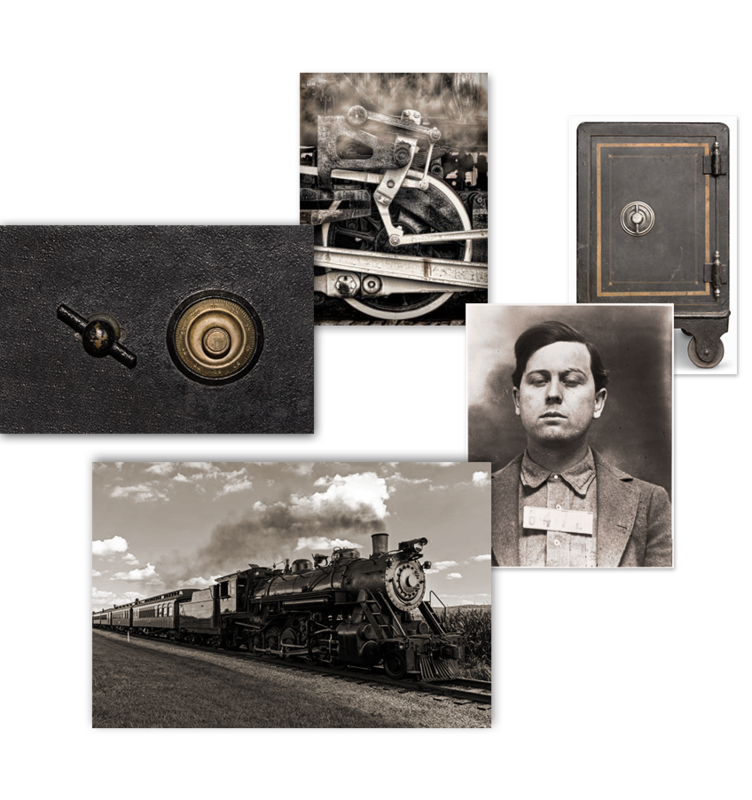 Steel made new products and construction methods possible, the steam engine revolutionized trade, and locomotives became a popular form of travel…as well as a target for robberies. This was one of the most historically significant periods for human ingenuity and manufacturing; a time when technology, trade, and wealth abounded – as did the need to protect it. Savvy thieves began to recognize their own insidious opportunities. Banks were forced to develop a means to safeguard the wealth entrusted to them, and larger than life burglars became famous for their antics. Enter the need for higher security. Robust safes and massive vault doors were created in response to these relentless robbers. Finally the ability to create such security had caught up to the need for it. 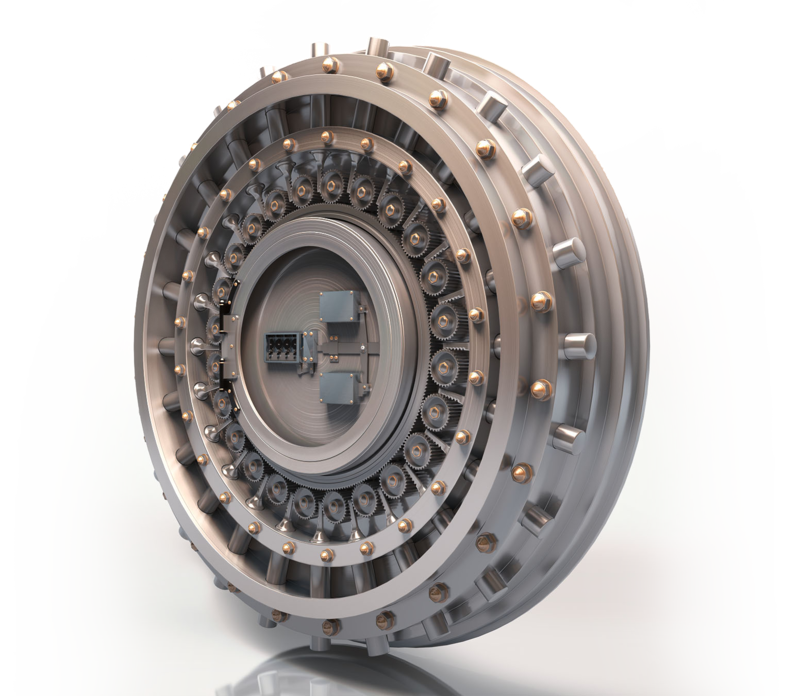 Borrowing technology originally developed during WW1 for the large round doors on U.S. battleships, the now iconic round bank vault door was born. The many layers of thick heavy steel, large locking bolts protruding from every side, and its complicated locking mechanism of multiple gears combined to create a door that wasn’t possible without the advancements of industrial production and the can-do spirit of the war effort. The scope and scale of these doors grew to levels which have never been reproduced since…until now that is. Classic styling of the Monument Round Vault Door is enhanced through thoroughly state-of-the-art materials and manufacturing. While much of the classical form is painstakingly reproduced to ensure maximum historical correctness, the function is greatly enhanced by modern engineering for a result that is a one-of-a-kind vault door true to the original – and an original all its own. Rebuilt ceramic bearing hinge system for effortless door operation. Mechanical triple redundant 144 hr. Timelock. Military grade fingerprint entry system. Twenty-four three inch hardened steel locking bolt system. Multi-layered interlocking plate-work resists thermic and penetration attacks.